Other members of the "family" are Espanto IV and V, who are sons of Espanto III and currently are in a semi-retirement status, El Espantito (mini version) and last but not least, Los Hijos del Espanto I and II (who currently wrestle in the Mexico independent circuit) all under the tutelage of Espanto II. 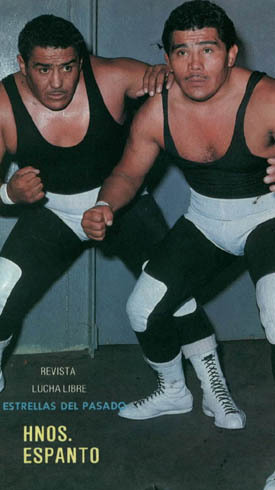 In AAA an Hijos del Espanto tag team appeared (Sergio and César Andrade Salas, brothers of Espanto Jr.) but they were legally taken the name as it they hadn't been given permission to use it by the remaining Espanto, the second one. This page was last edited on 14 October 2018, at 09:18.